Seasonal times Bar hours extended in Festival to 3am. Bar open Sun–Thu 9am–midnight; Fri/Sat 9am-1am. Food served Mon–Fri 8-10.30am, noon–10pm; Sat/Sun 8am–10pm. 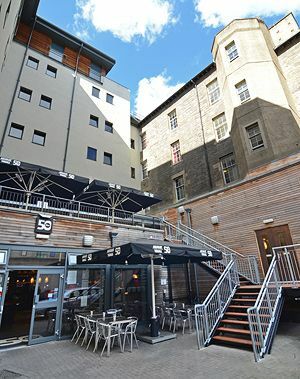 Fortunately for backpackers seeking refuge after long hours of travelling to Scotland’s capital, the journey to one of the Cowgate’s liveliest and most hospitable bars is a short one. As well as beds for visitors to the city, Smart City Hostel by Safestay have created an open lounge space for mingling and refuelling. A buffet breakfast for guests is a backpackers dream – haggis is incorporated, to fuel a day of exploring. Their all-day menu attempts to maintain a Scottish theme, offering Innis and Gunn battered fish and chips, and bursting at the brim Buccleuch burgers, among other stodgy options. As for drinks, the recommended cocktails are dangerously priced at £3.50 a pop, while other options include a far too drinkable Star Anise Martini and a good selection of Scottish whiskies and beers. Notable dish: Southern fried chicken burger. Live entertainment: Open mic evenings, quiz, festival events (comedy), occasional BBQs.